Your invitation to perform in Italy! I hope you might be in a position to consider this invitation to perform with me in Rome in late June/early July 2015. Join with other fine young choirs as we meet in Rome to rehearse and then perform both individually and as a festival choir singing Mass at St. Peter’s Basilica and in the festival gala concert. 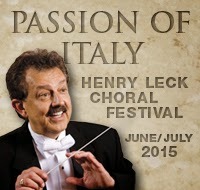 For those that wish it, travel with me to Tuscany for a further gala concert in Florence.